A bit over the top ? Today is my 66th birthday, and I’m not quite through battling a bout with the flu, but there’s so much that needs to be done…3 weeks of laundry, vacuuming, dusting, grooming dogs, catching up on e-mails and going grocery shopping. But, for the past 2 days I find myself mesmerized by these 4 ½ week old bundles of fur seeing, and experiencing things for the first times in their precious lives. 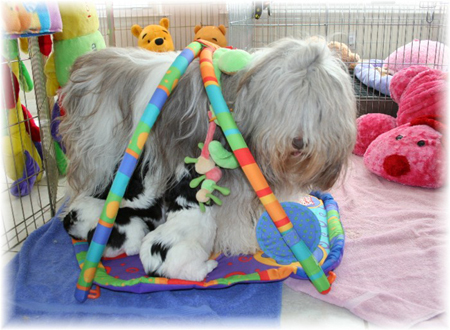 There are 6 of them…3 boys and 3 girls….all black and white, chunky, happy, little Polish Lowland Sheepdog puppies. I was just sitting here watching Bogie push a brand new wagon across their play pen. It is 4 times his size and there is a huge sheep in it. On the opposite end of the wagon is one of the little girls, standing on her back legs with the sheepie tongue in her mouth, and walking backwards…pulling the wagon, she believes. To my left, the Zuni Princess is looking at herself in the mirror of their play gym, while another one is using his paws to try to capture the butterfly dangling from the top of the play gym. All of a sudden there is the soft sound of music, and there to my right is Hobie chewing on a small bear that plays music when you press on it…his head cocking left and right as he seems to be enjoying his newest accomplishment. I look around for the last little girl, and find her laying on her back, in the middle of a huge stuffed pink puppy, sound asleep, with a beautiful ray of sunshine streaming through the window, allowing her to feel warm and secure. It is such a beautiful moment and I want to share it with my best friend, Julane. She would have loved every minute of this. I can only share it with her from my heart, as she left this earth 30 days ago. A magnificent monarch butterfly is at the bay window fluttering her wings, sharing this peaceful moment in time. I know it’s her, and she’s telling me she does see the beauty and the joy that these amazing creatures bring to us, and always have. If she were here she’d be sitting right in the middle of the play area hugging each and every one, and then trying to figure out which one was going to be the next best show dog. She had a sixth sense about these things. A few days ago I received an email from another PON person, who had seen some of the myriad of puppy photos I sent out and, although she thought the photos were really cute and mentioned all the toys they have, her last comment was “Perhaps, just perhaps, a bit over the top?” If going a “bit over the top” brings this kind of joy and learning experiences to the pups, and causes me to forget everything else that’s going on in my life, at the moment, and causes my heart to overflow with love and memories of good friends, then I always want to be “a bit over”. and the people that do mind, don't matter."